Eni has announced a giant natural gas discovery at the Mamba South 1 Prospect, in the Area 4 Offshore Mozambique. The discovery well encountered a total of 212 meters of continuous gas pay in high-quality Oligocene sands. The Mamba South 1 discovery well is located in water depths of 1585 meters approx. 40 km off Cabo Delgado coast, in the Northern offshore of Mozambique. This is the first exploration well in Area 4. Results exceed pre-drill expectations and confirm the Rovuma Basin as a world-class natural gas province. The well will be drilled to reach an expected total depth of around 5000 meters. After completion of drilling and testing activities, the rig will move to drill the second commitment well, Mamba North 1. Eni considers that this impressive discovery can lead to at least 15 tcf of gas in place in the Mamba South Area where the potential of the Tertiary Play that exists in Area 4 will be further assessed under the present drilling. The outstanding volume of natural gas discovered will lead to a large scale gas development with a combination of both export to regional and international markets through LNG and supply to the domestic market. This will support the industrial and economic growth of the Country. The Mamba South discovery marks a new milestone for Eni since the resource potential assessed with the first exploration well makes it the largest operated discovery in the company's exploration history. The exploration success in Mozambique expands the leadership of Eni in Africa by opening a new eastern front of activities. Eni is the operator of Offshore Area 4 with a 70-percent participating interest. Co-owners in the area are Galp Energia (10 percent), KOGAS (10 percent) and ENH (10 percent, carried through the exploration phase). Note: The Eni discovery lies to the east of Anadarko's discoveries in Area 1, offshore Mozambique. Anadarko's successful drilling program offshore Mozambique has confirmed that the Windjammer, Barquentine, Lagosta and Camarao complex holds at least 10 Tcf (trillion cubic feet) of recoverable natural gas resources. Anadarko recently announced that it was mobilizing a second deepwater drillship to the Rovuma Basin to accelerate its drilling campaign, which includes an extensive reservoir testing program and up to seven exploration/appraisal wells over the next 12 months.' 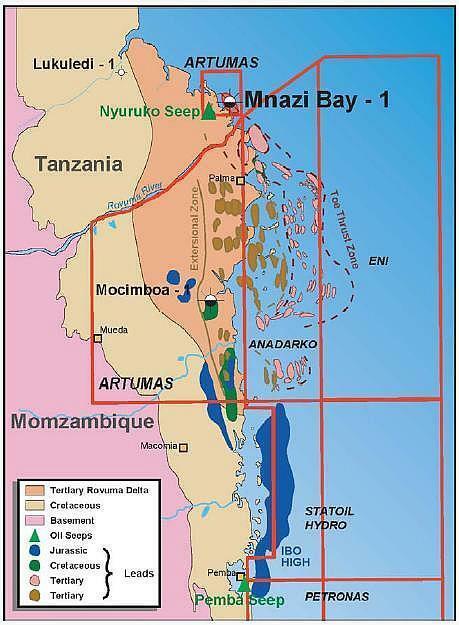 See Anadarko announces new exploration and appraisal success offshore Mozambique for information on the Anadarko discoveries (including map).